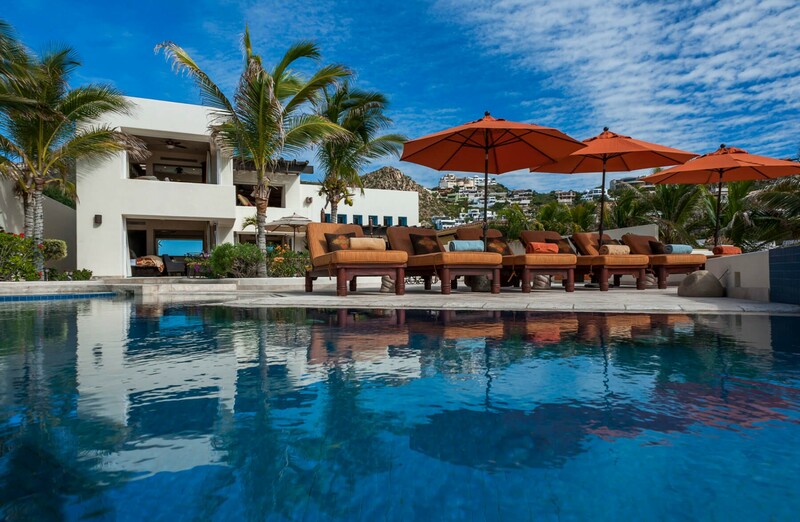 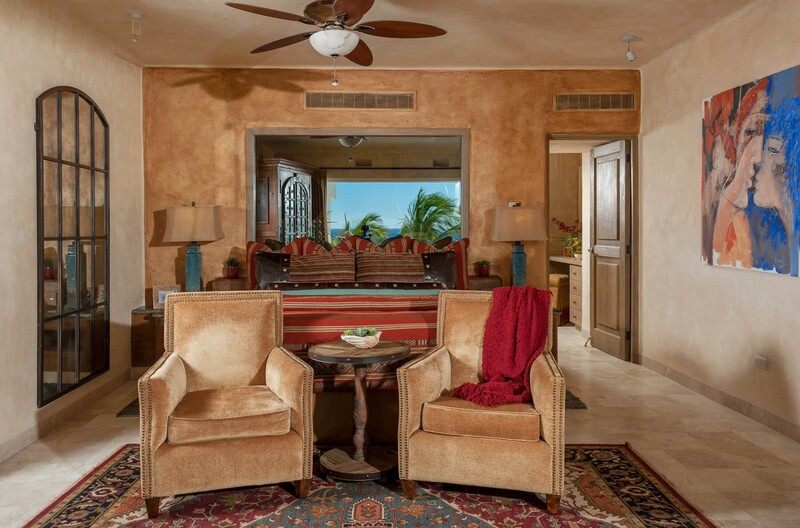 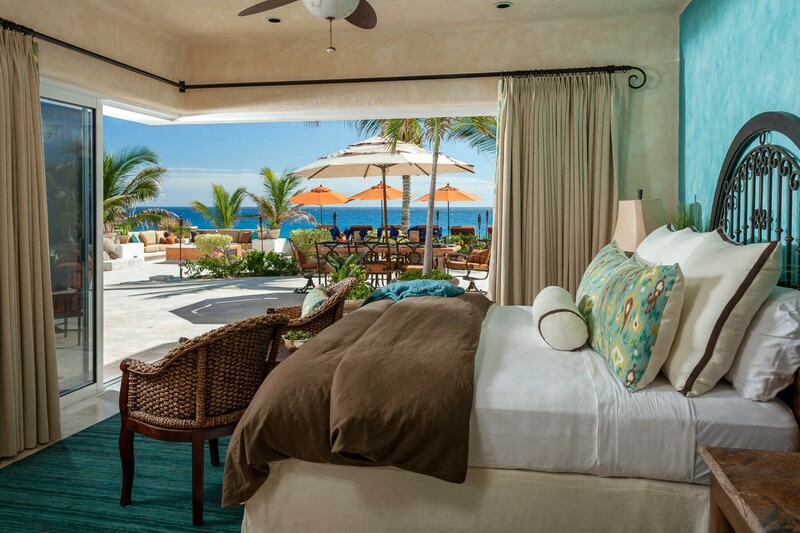 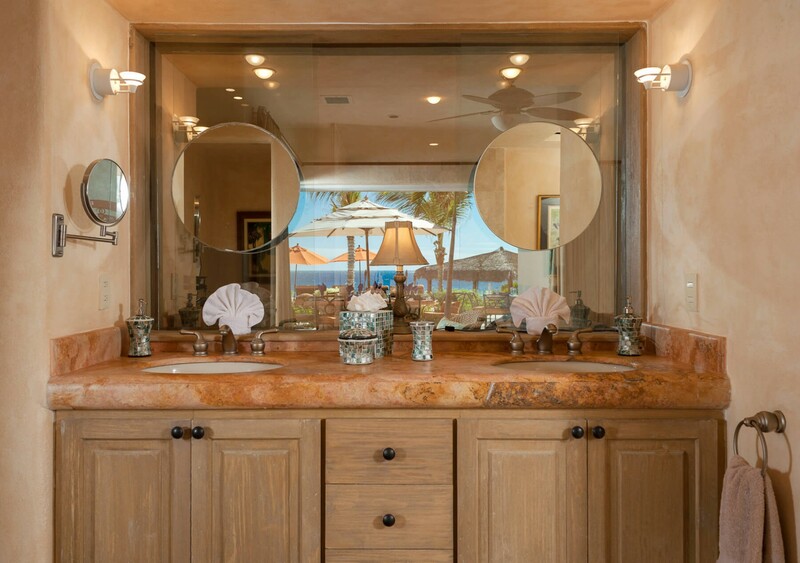 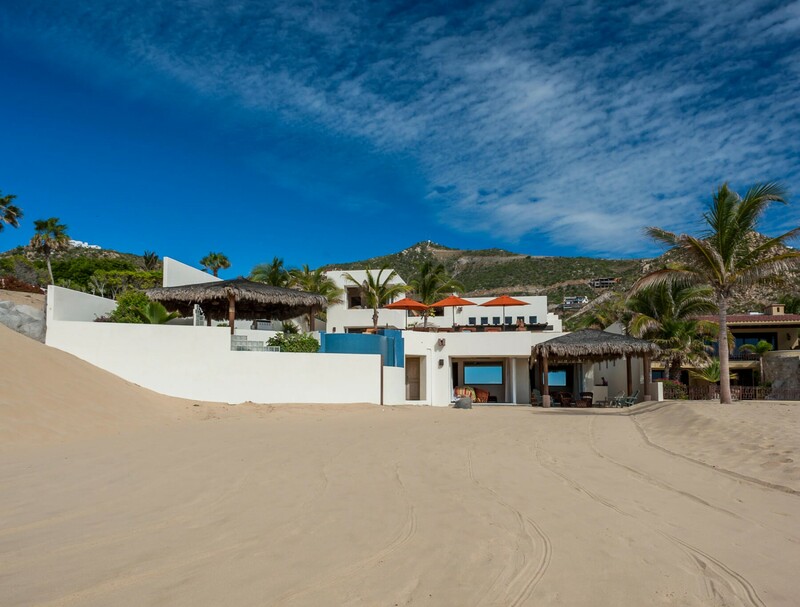 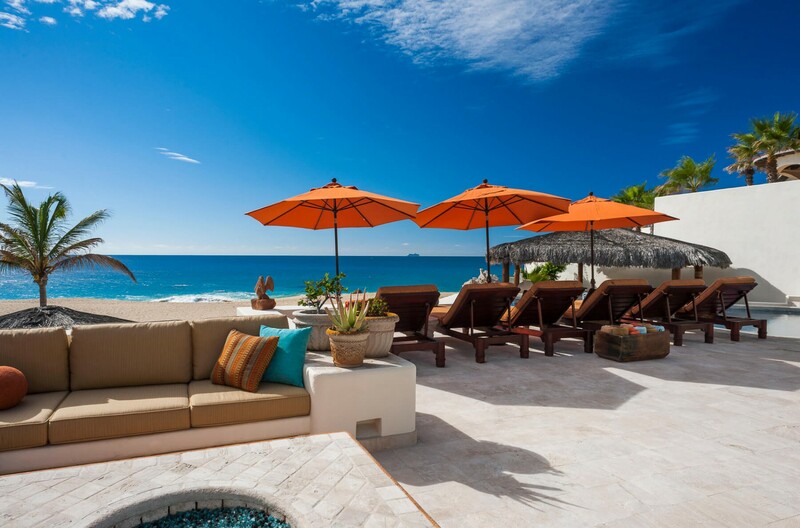 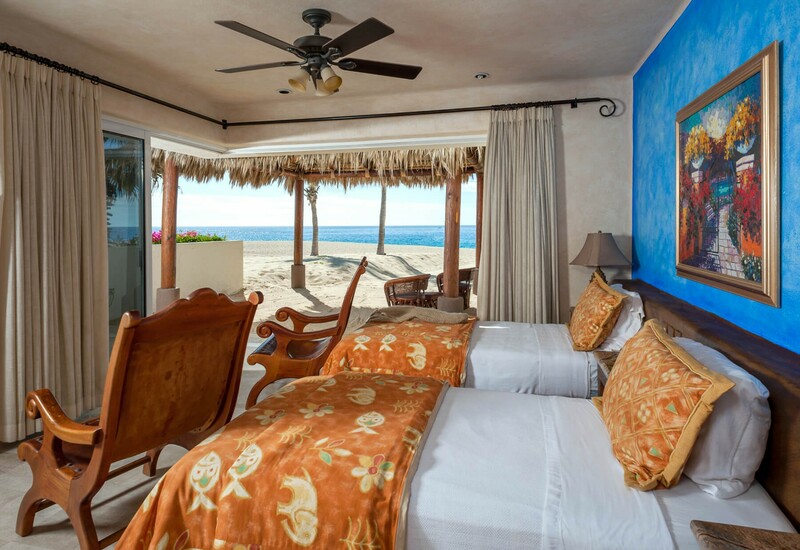 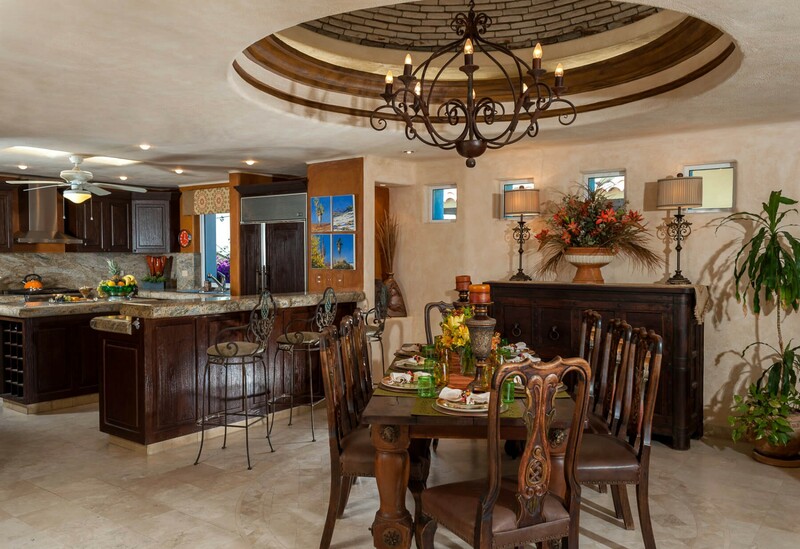 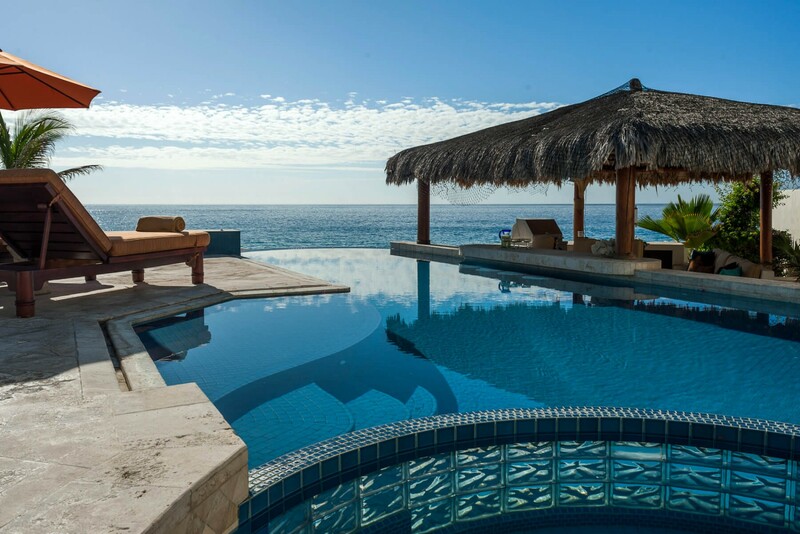 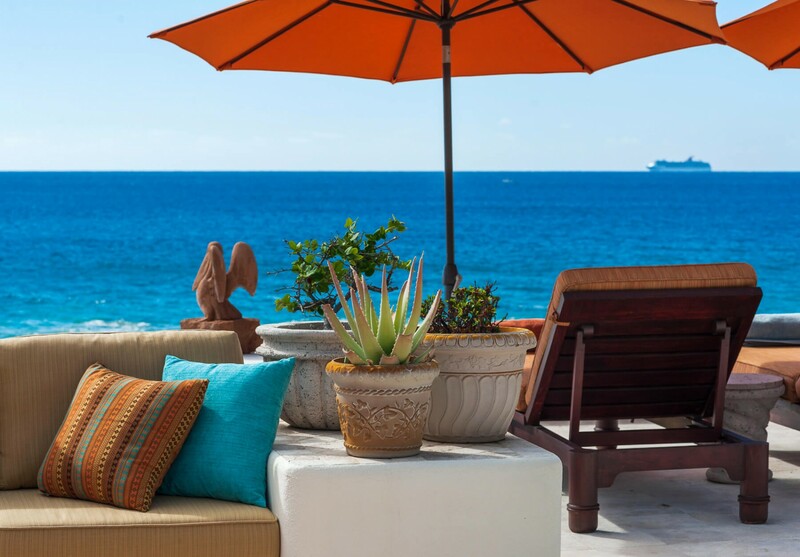 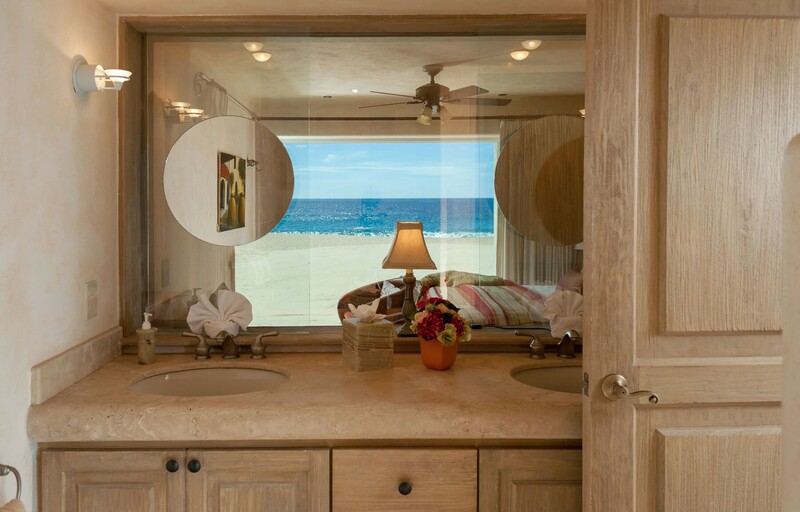 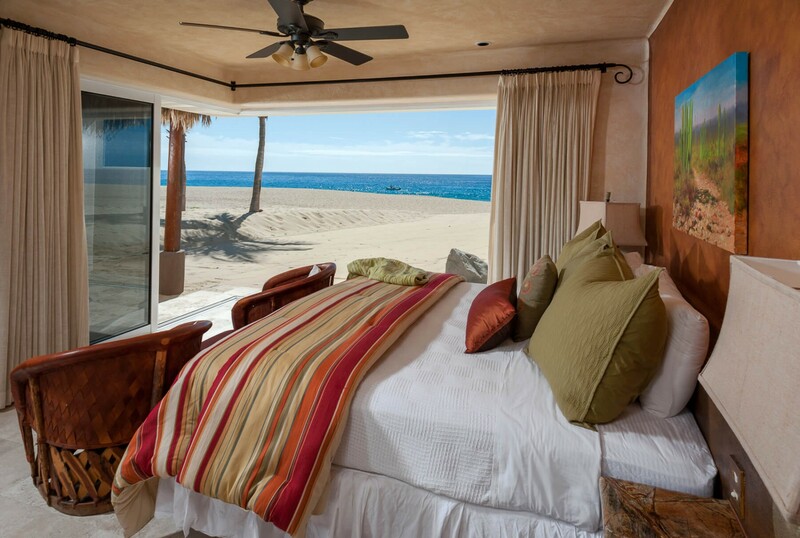 Welcome to Casa Alcini, a spacious 8-bedroom villa at the edge of the southern-most tip of Baja California Sur, Cabo San Lucas. 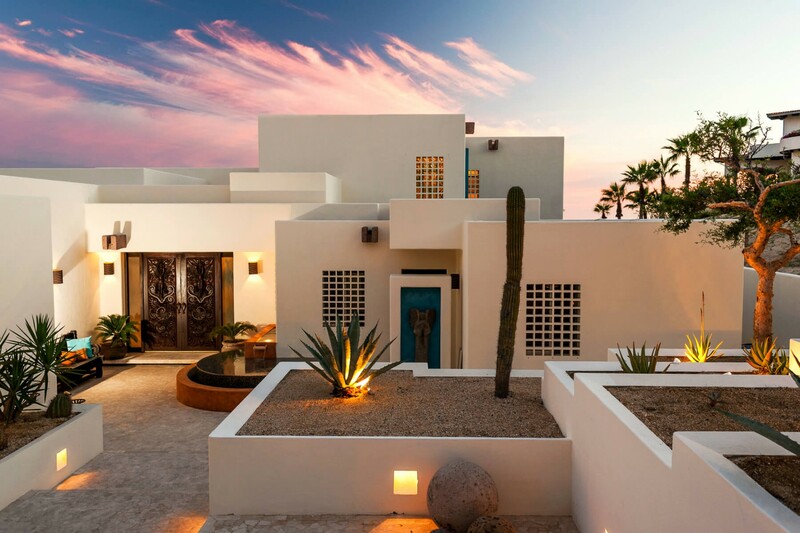 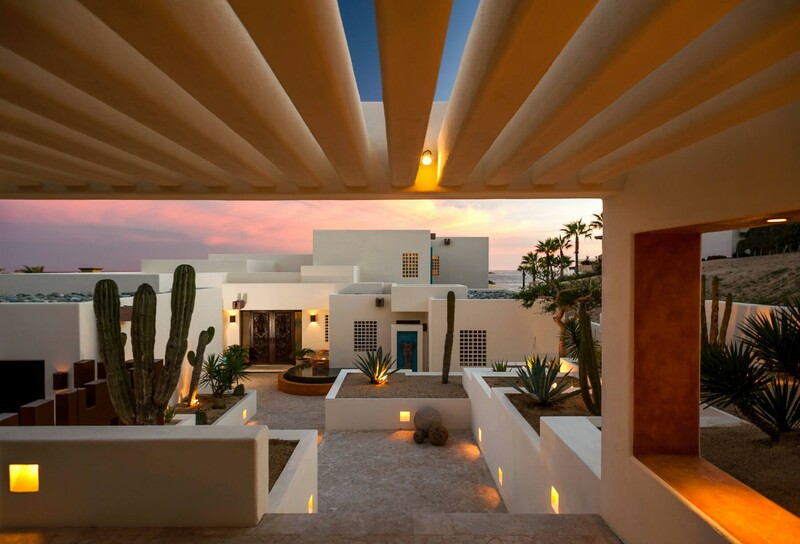 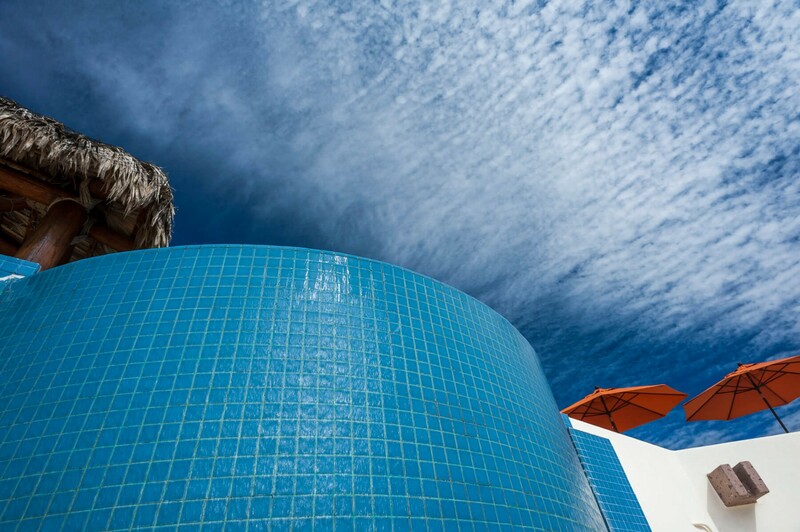 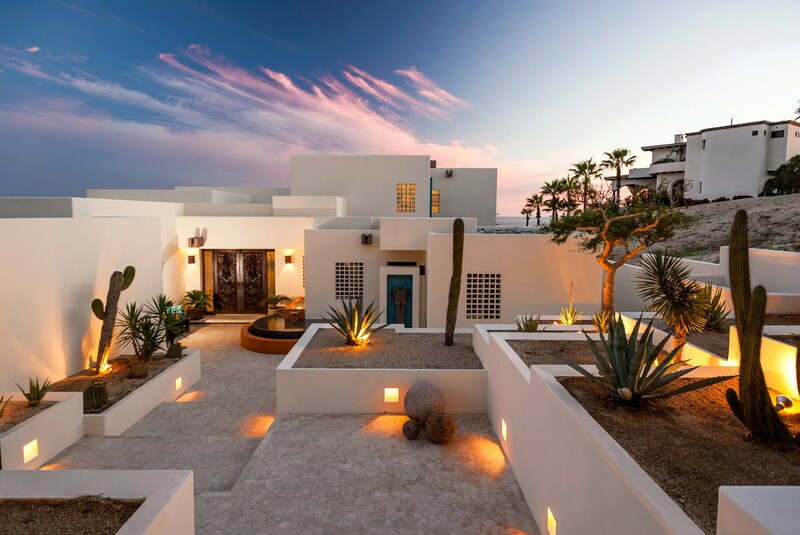 Casa Alcini, angular and modern in its design, has Santa Fe influences, a popular architectural style of the Southwestern United States in the early 20th century. 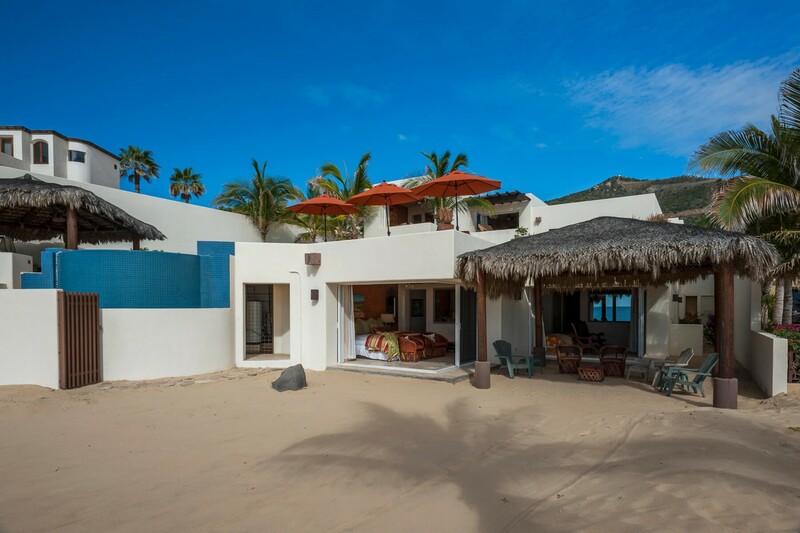 Though it emulates features of the typical Mexican adobe in its construction, it is decidedly modern, with brilliant white walls of the exterior inset with large windows to maximise the light into the villa and allow guests to gaze upon the formidable Pacific Ocean from the comfort of their rooms. 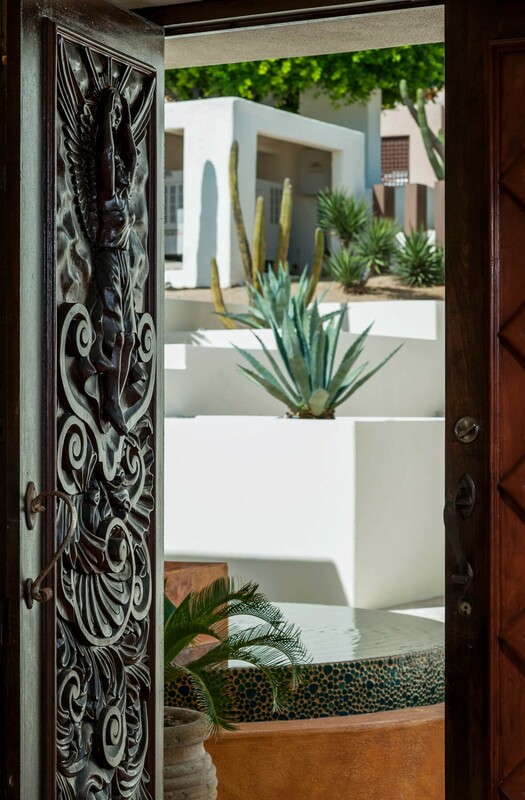 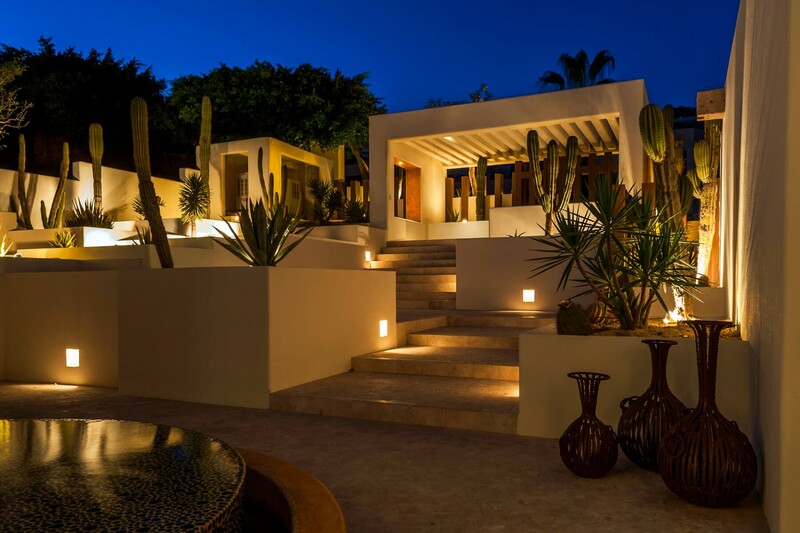 With several indigenous plants and cacti installed in various areas in both the front and back of the property, Casa Alcini becomes a building firmly rooted in the influences of Mexican culture. 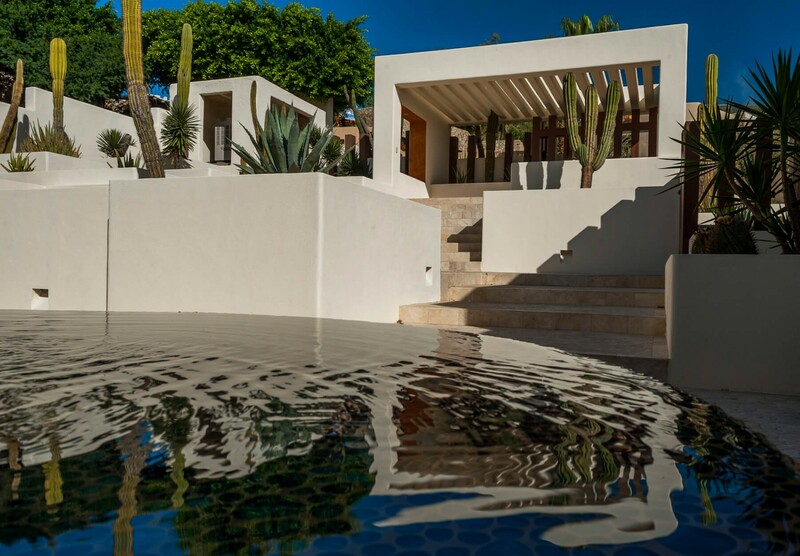 The villa sits on an area of 7,000 sq. 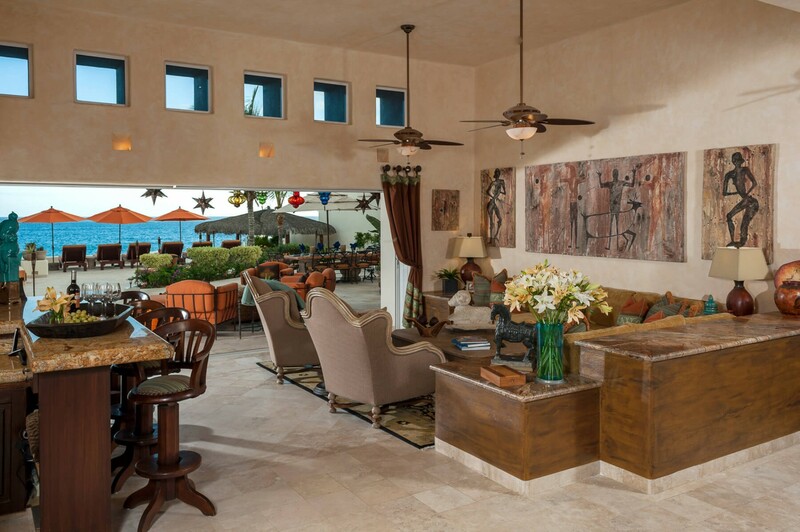 ft., and the terrace a further 4,000 sq. 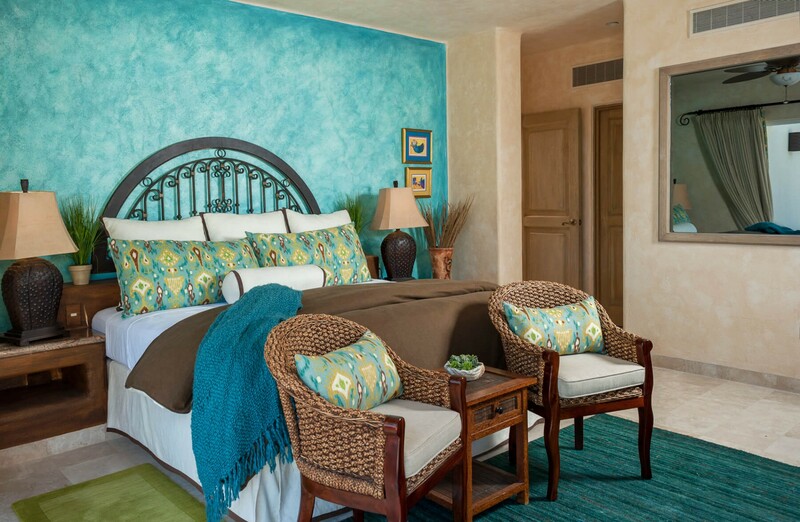 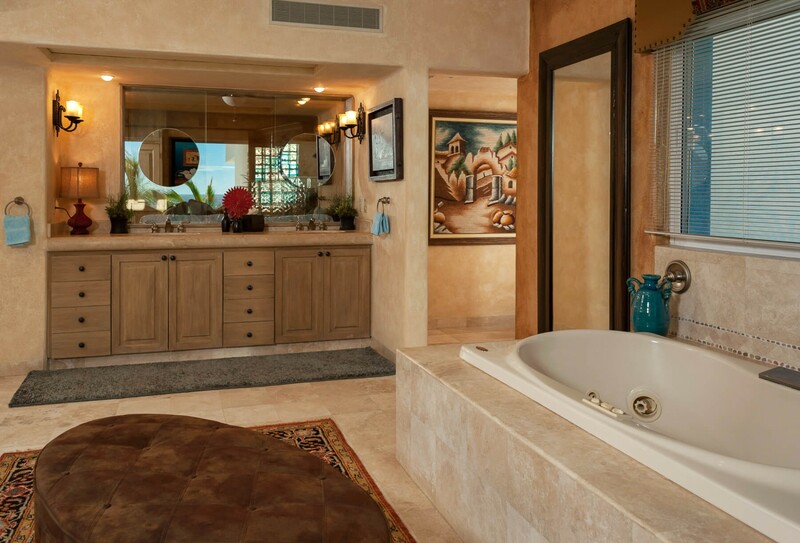 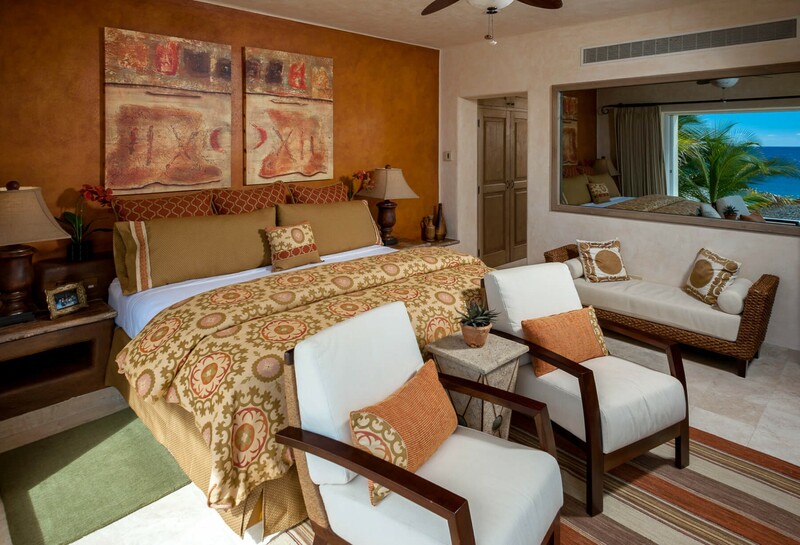 ft, allowing guests the freedom to roam the expansive grounds in private and in comfort. 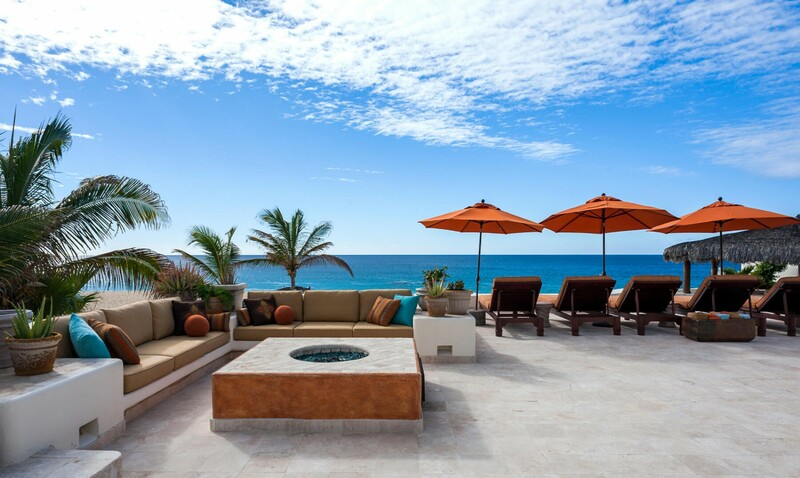 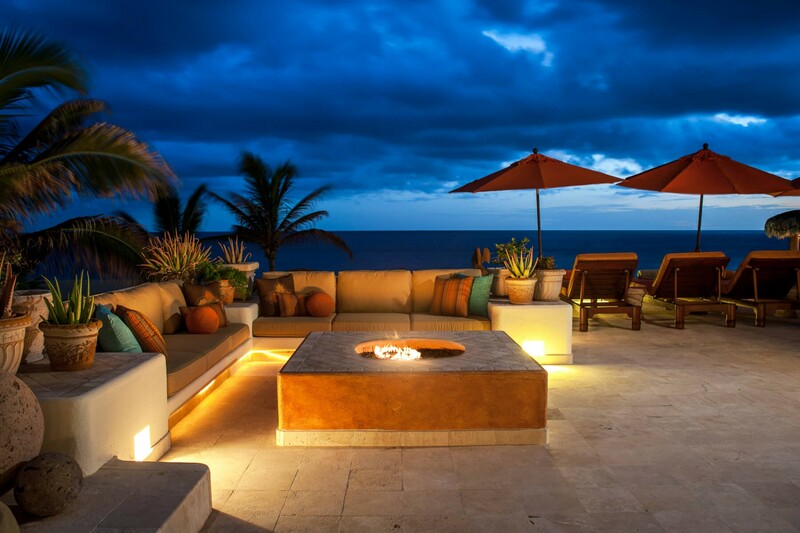 Outdoor living spaces are in plentiful supply here, making it perfect for entertainment. 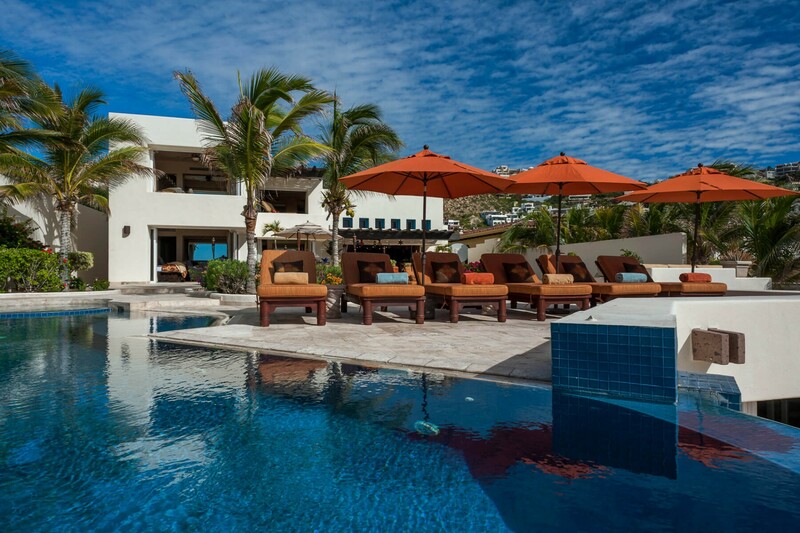 A palapa-shaded barbeque area, a large fire pit surrounded by plush couches and chairs, several sun loungers, a dining area perfect for al fresco dining, and a coffee table with comfortable arm chairs to enjoy the morning sun, all encompass the large infinity-edge swimming pool, exclusive to the villa guests, with optional heating. 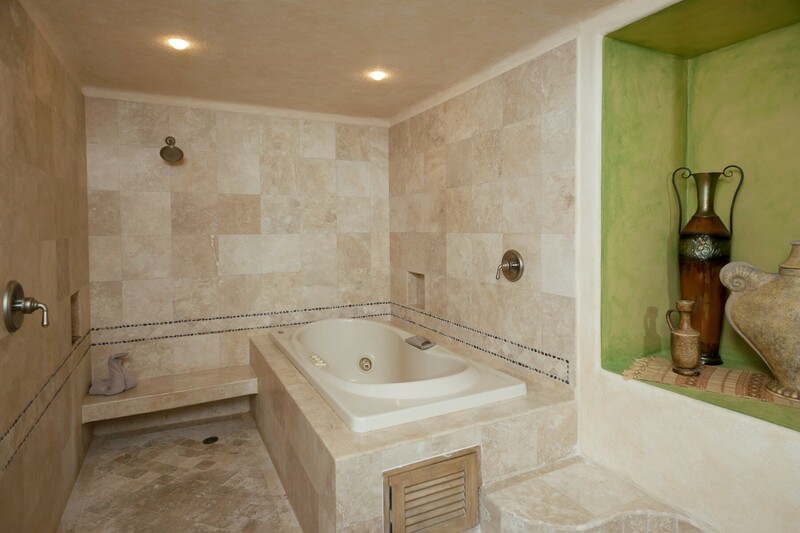 A jacuzzi sits adjacent to the pool, giving the option to relax in the bubbling waters, and go for a swim without having to leave the water. 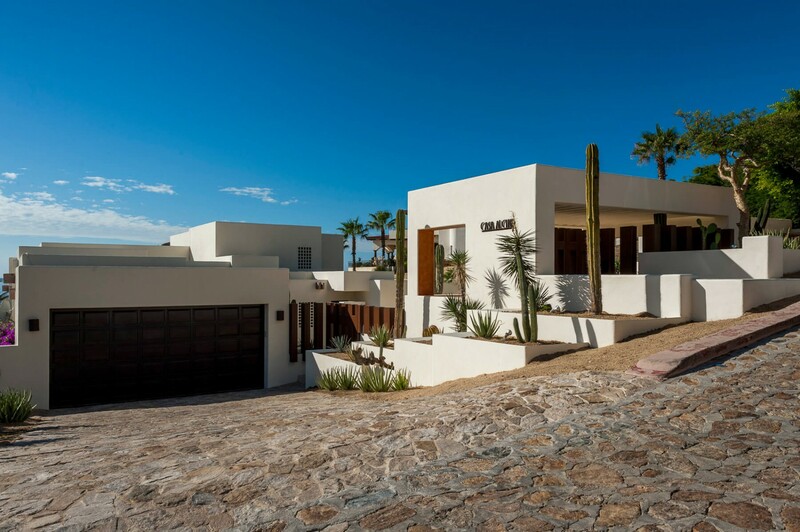 Surrounded by the native flora of the region, Casa Alcini will truly feel like an oasis in the arid Mexican desert. 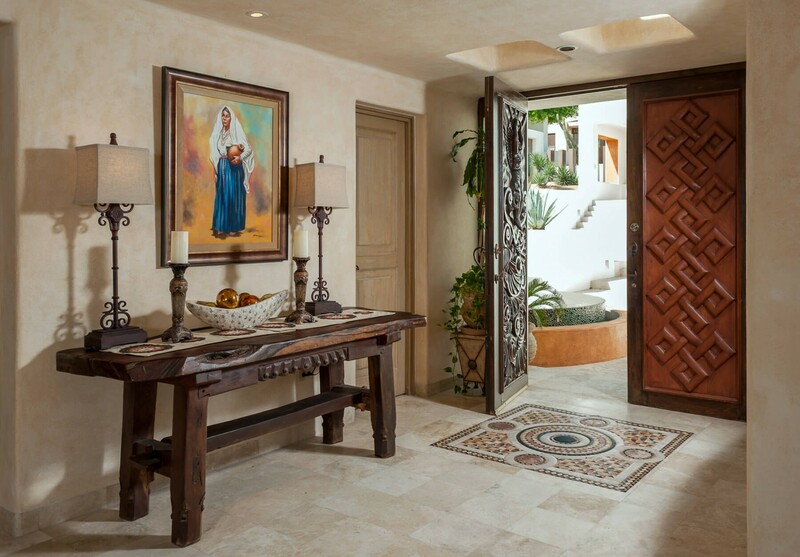 The interior is tastefully furnished, with beautiful wooden carved furniture in almost every room, from the tables and chairs to the doors and dressers. 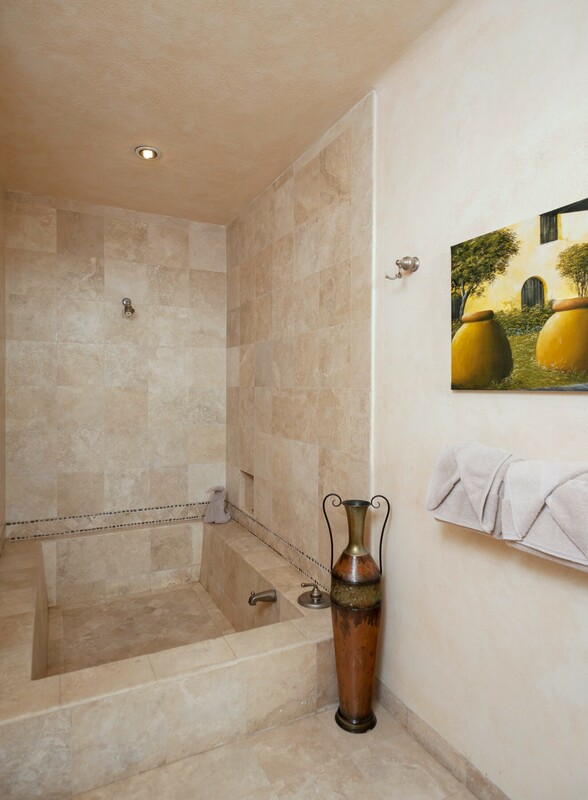 To contrast with the dark wood, a palette of beiges and creams are used in the floors, walls and ceilings to balance. 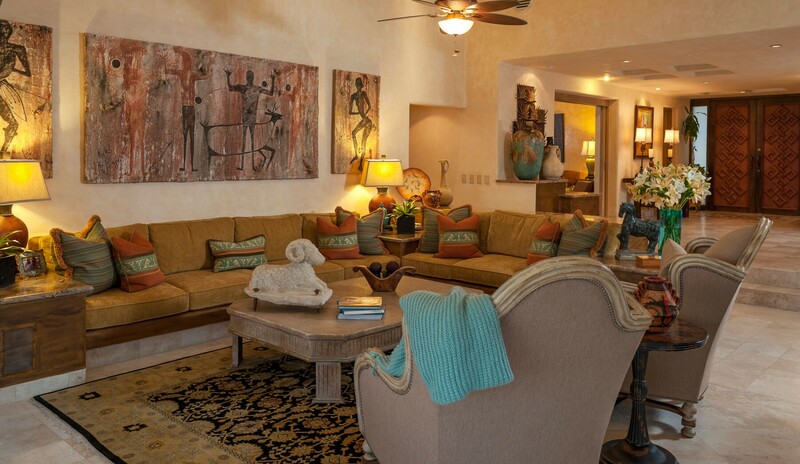 To accent this, the walls are embellished with large colourful paintings, and sculptures and vases populate the coffee tables and dressers. 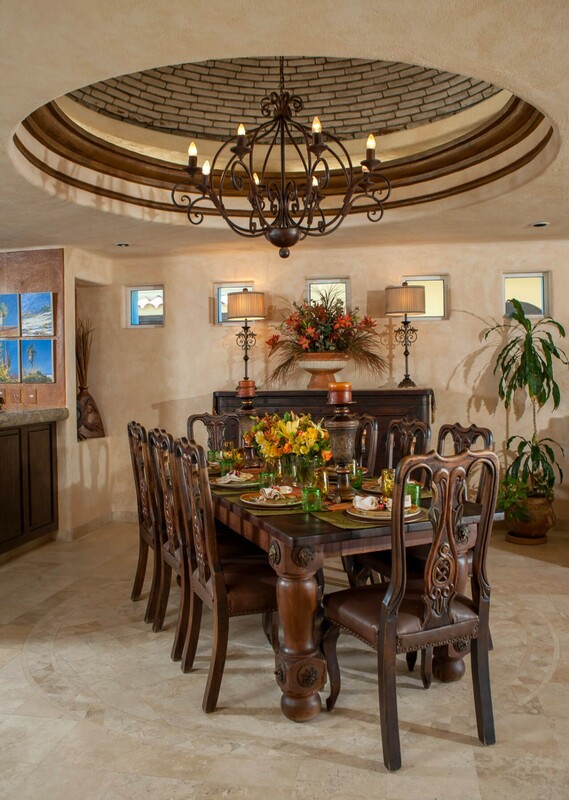 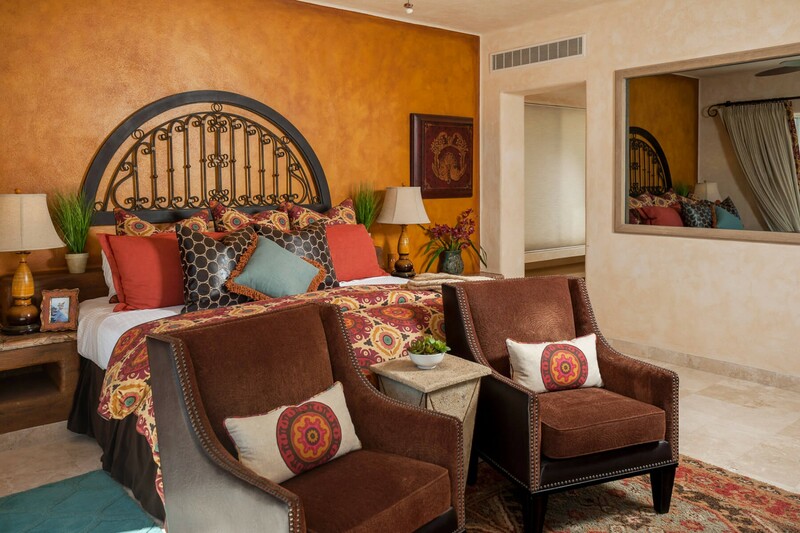 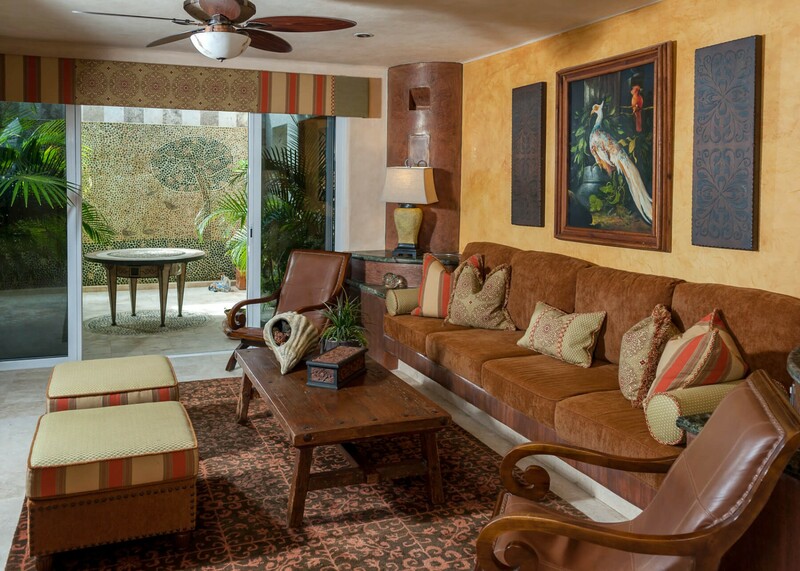 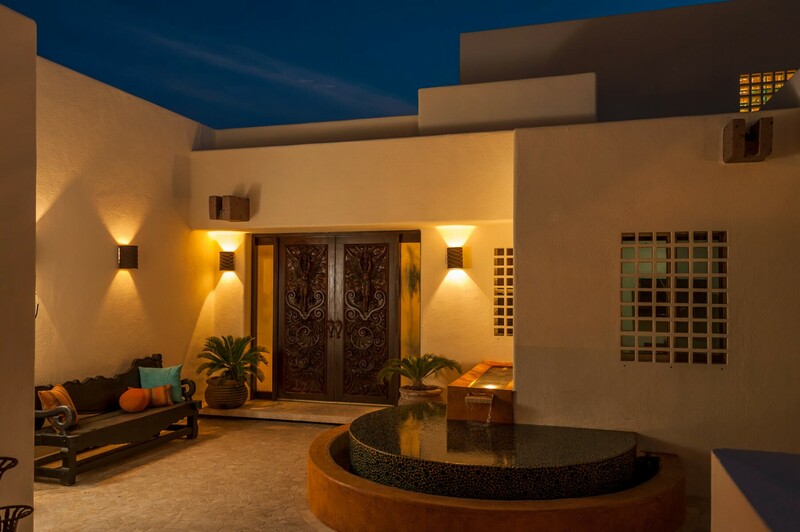 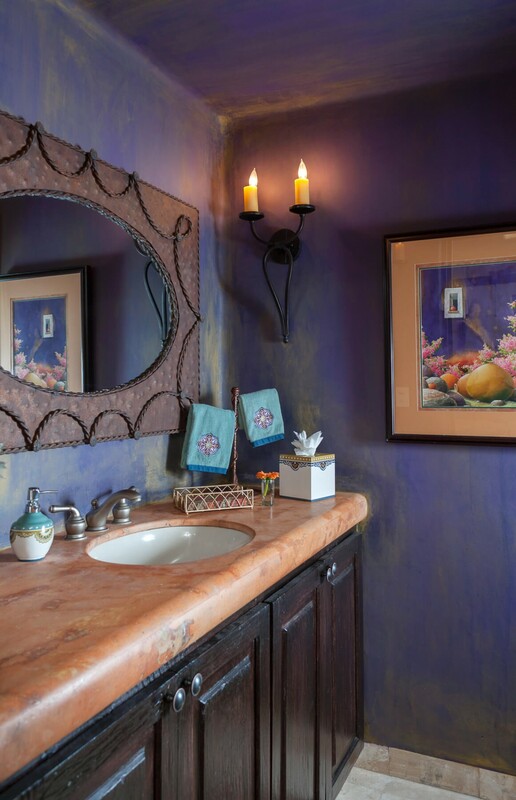 Lamplight casts a golden glow in the rooms and augments the rich heritage that Mexican art boasts to guests of the Casa. 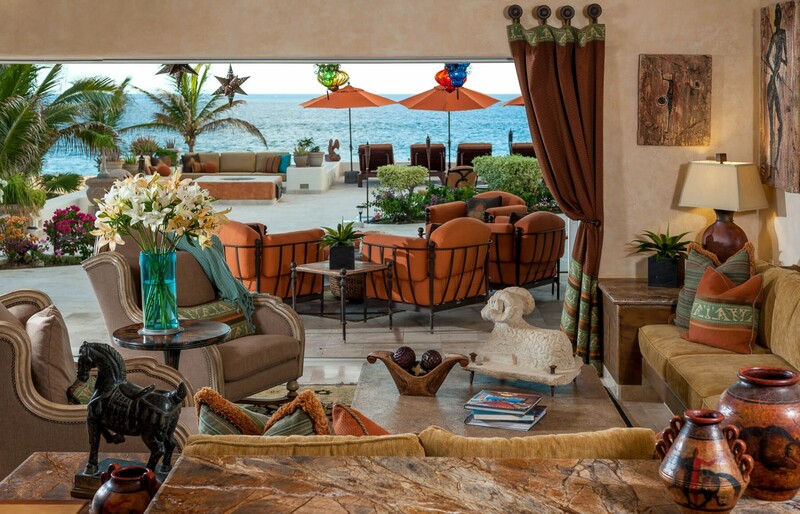 An open-plan interior, combining the foyer, lounge, kitchen and dining areas draws the eye all the way out to the terrace, and to the Pacific Ocean, from the moment guests set foot inside the front door. 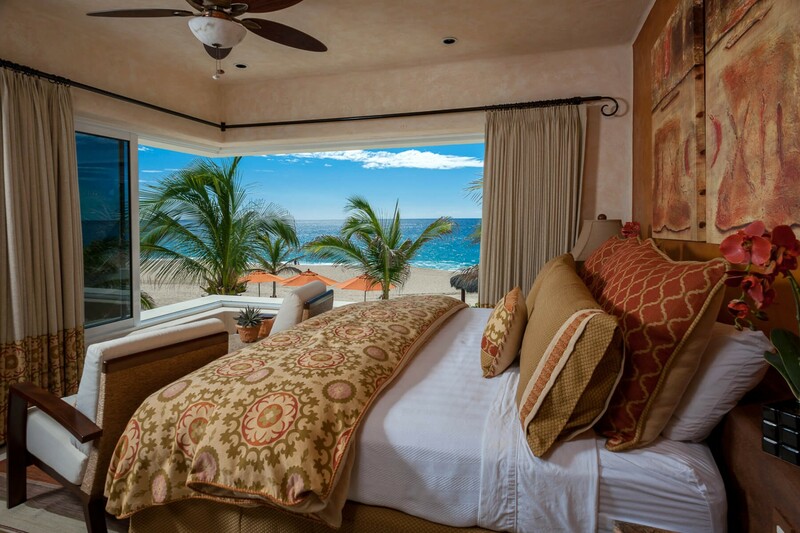 The bedrooms are no less adorned to the rest of the villa; the six bedrooms in the main building, complete with en-suite bathrooms, all have direct access to the terrace, as well as a wonderful seascape view. 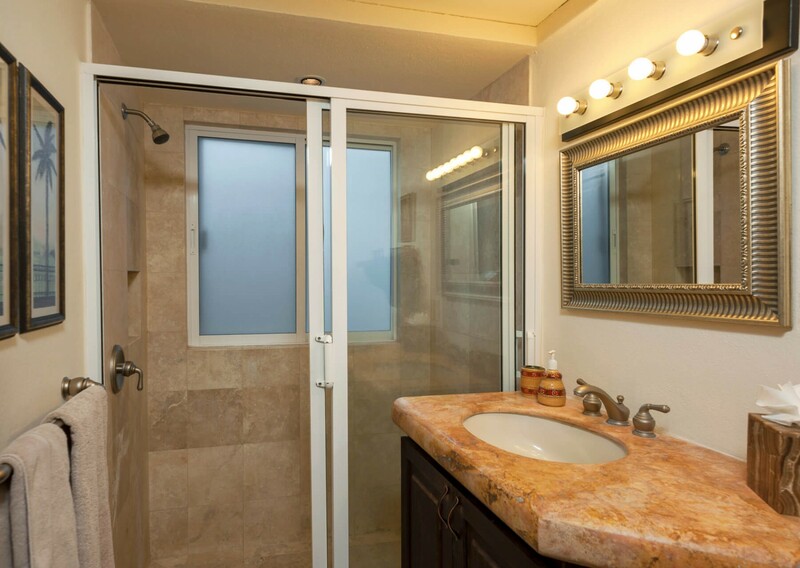 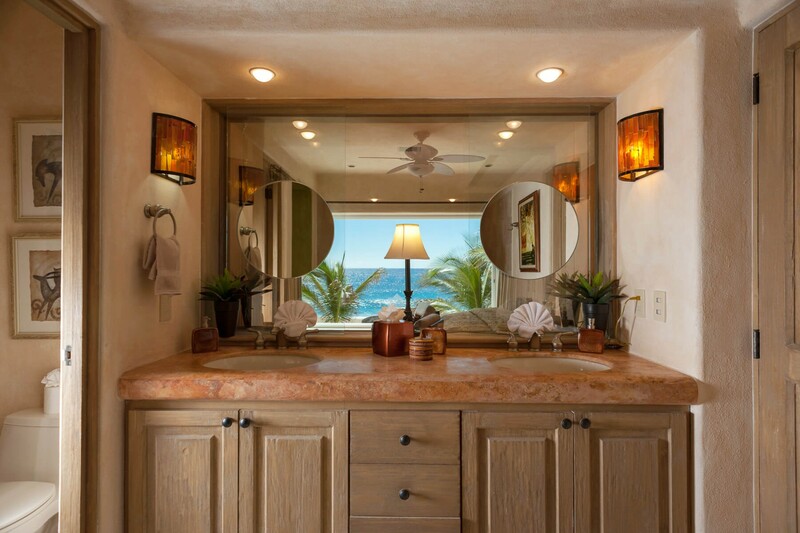 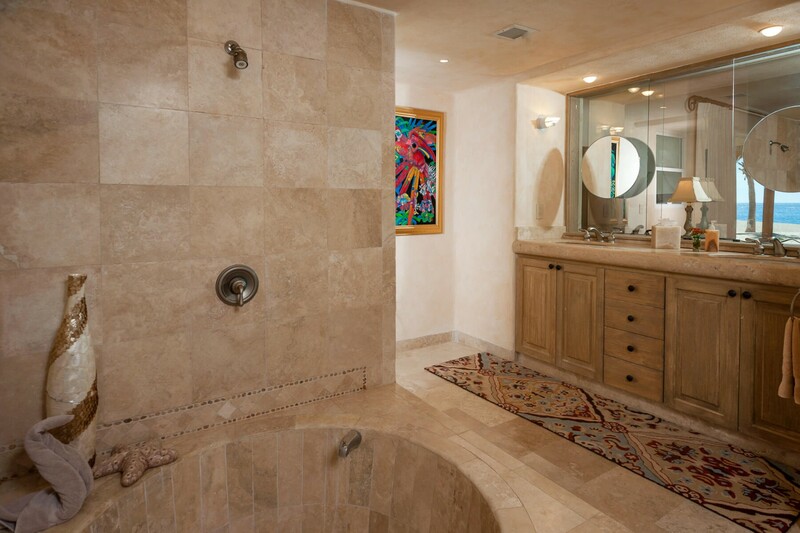 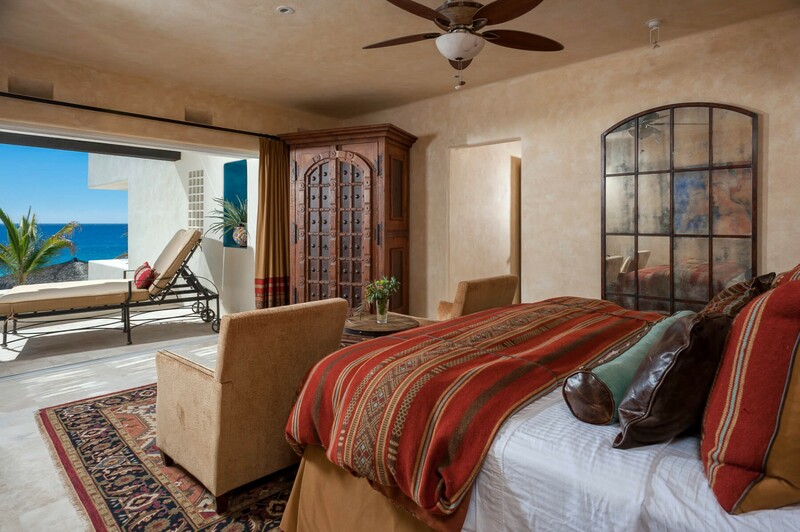 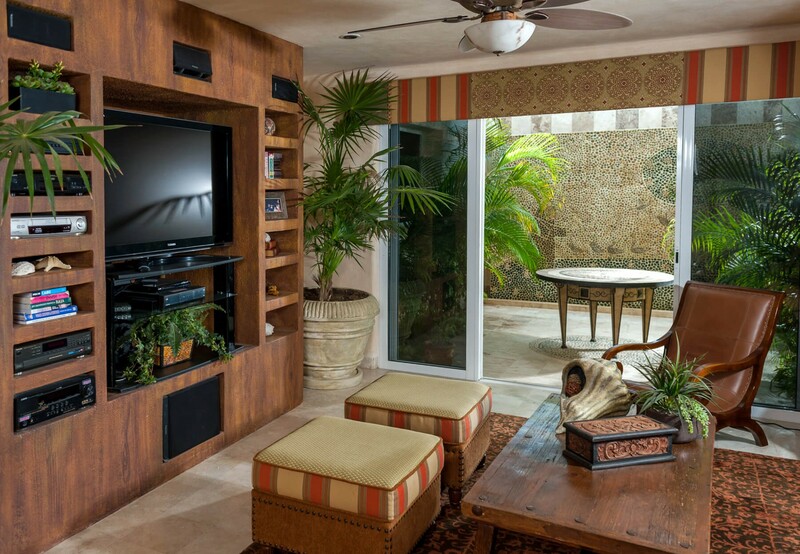 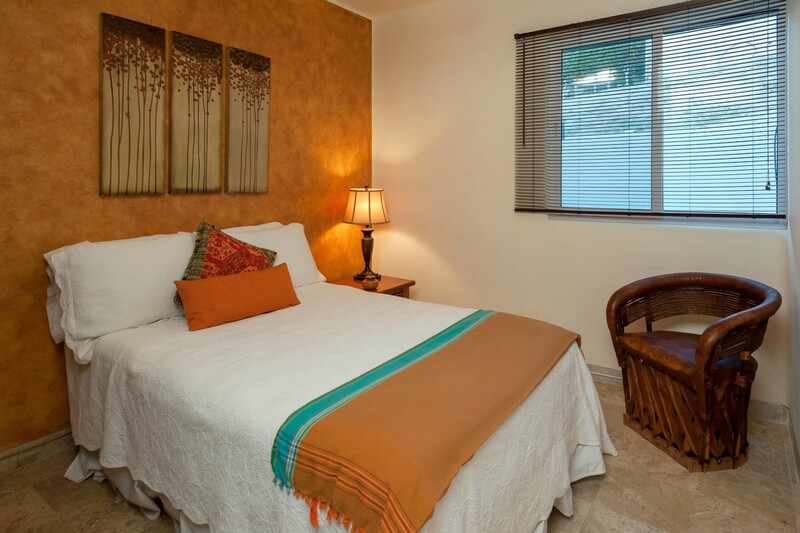 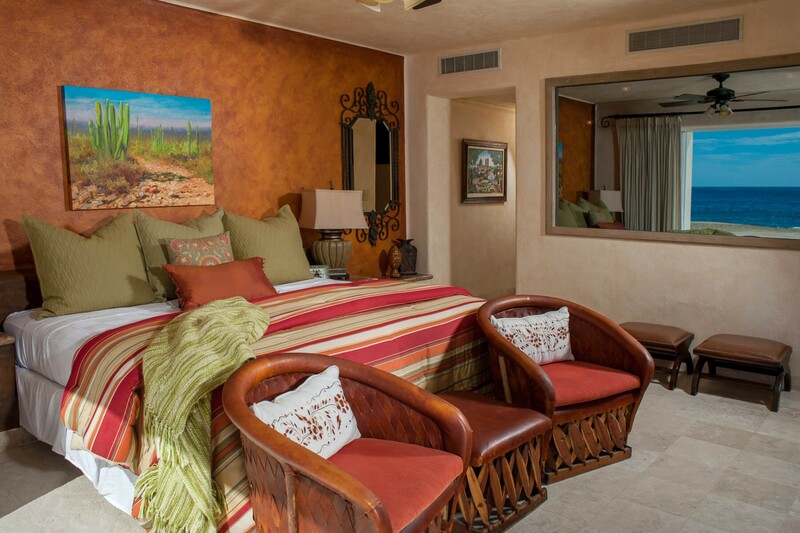 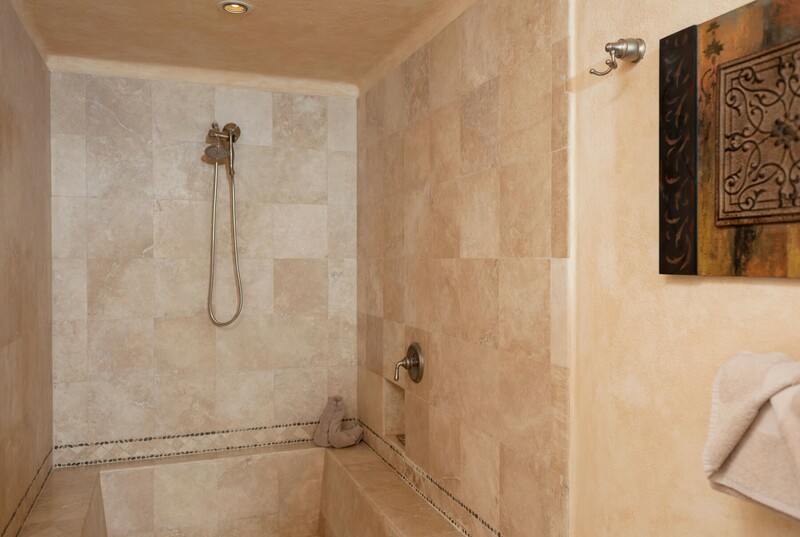 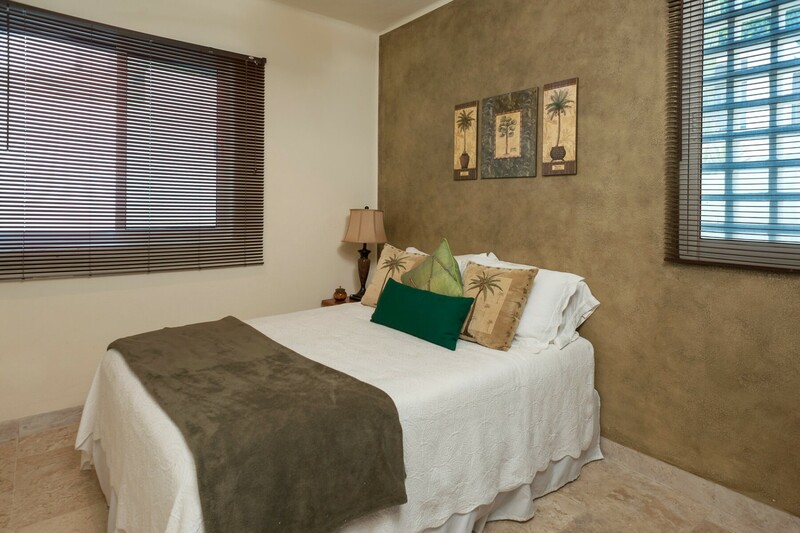 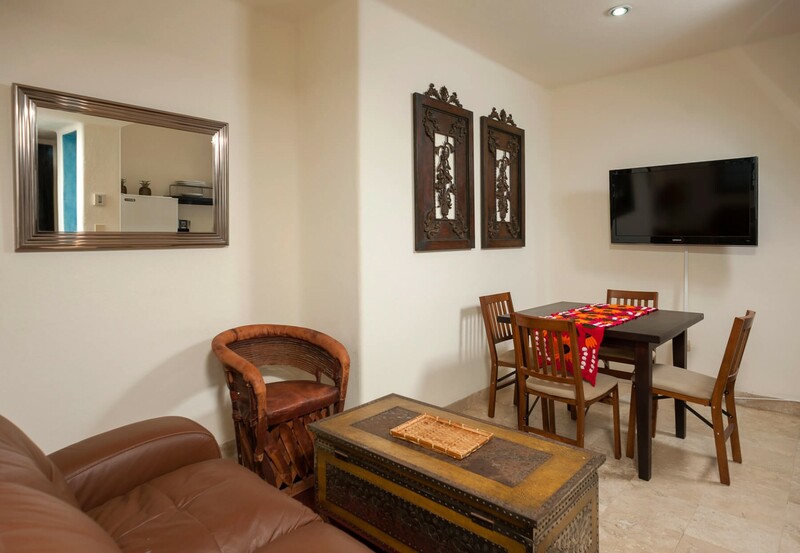 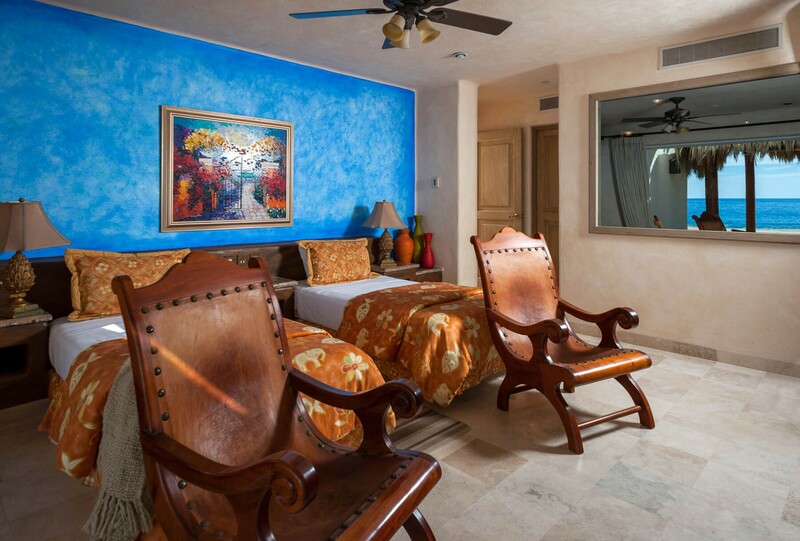 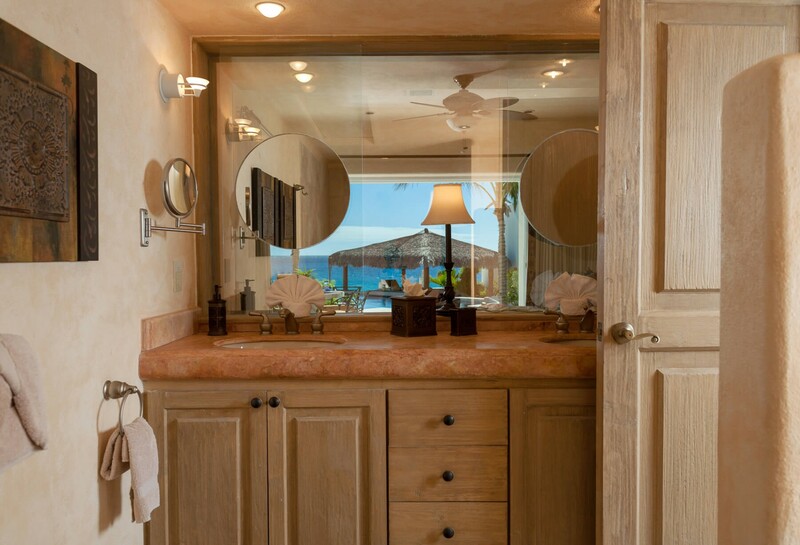 The two bedrooms in the self-contained casita are located at the front of the main villa and share a bathroom. 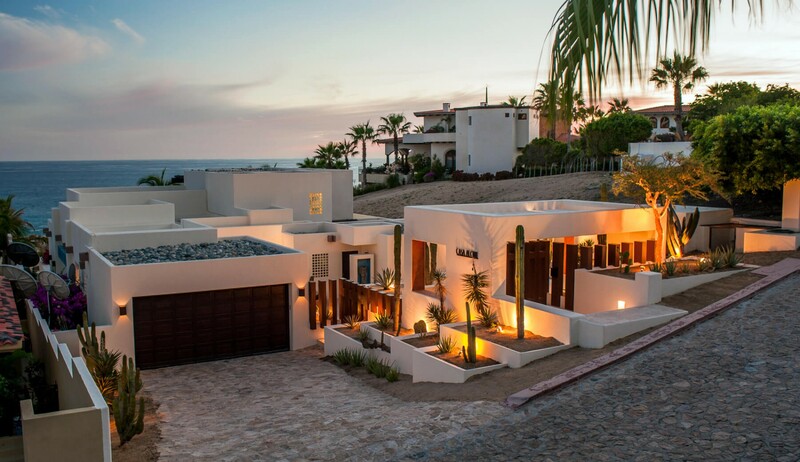 Located at the southern-most tip of Baja California Sur, also known as “The aquarium of the world” due to the rich away of wildlife and ecosystems it supports in its waters, Cabo San Lucas is a distinguished vacation and spa destination, with plenty of nightlife and activities for guests to delight in and enjoy. 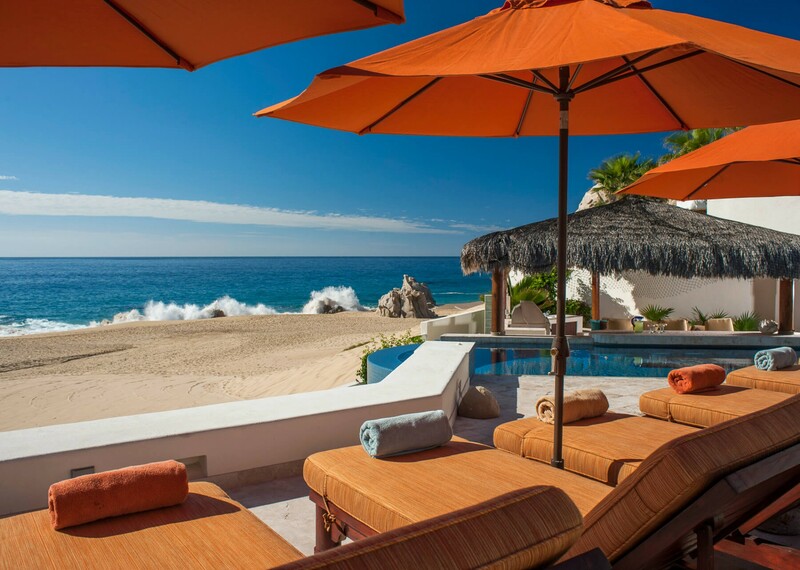 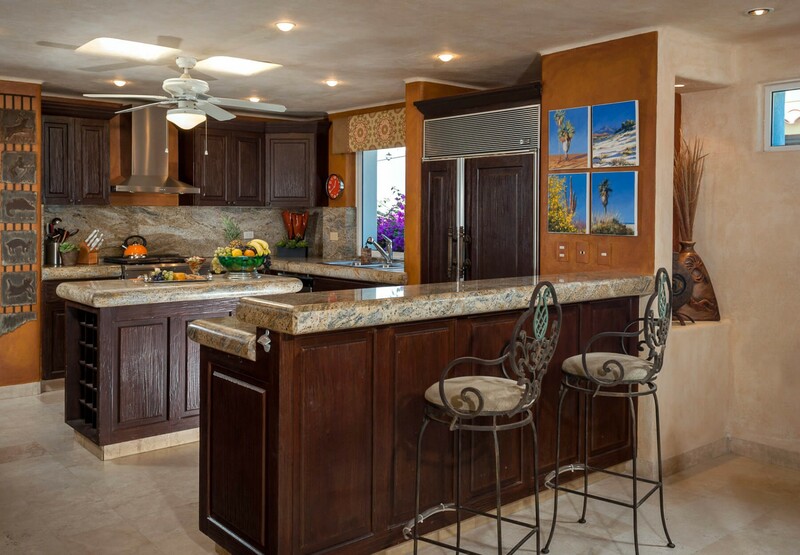 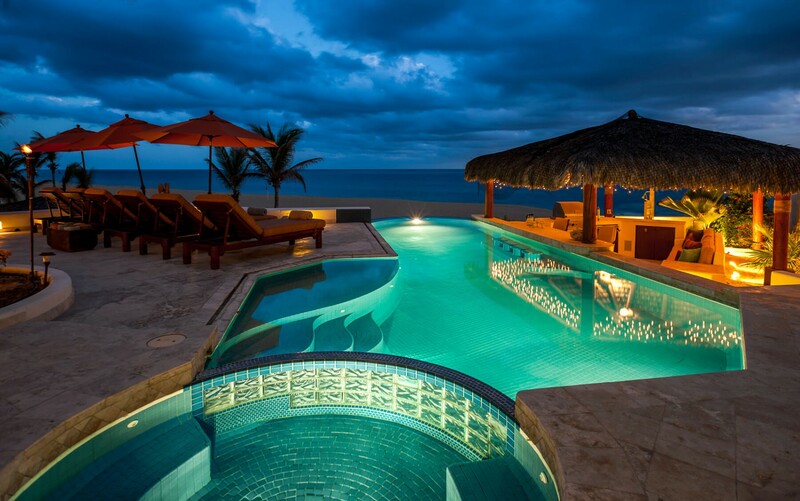 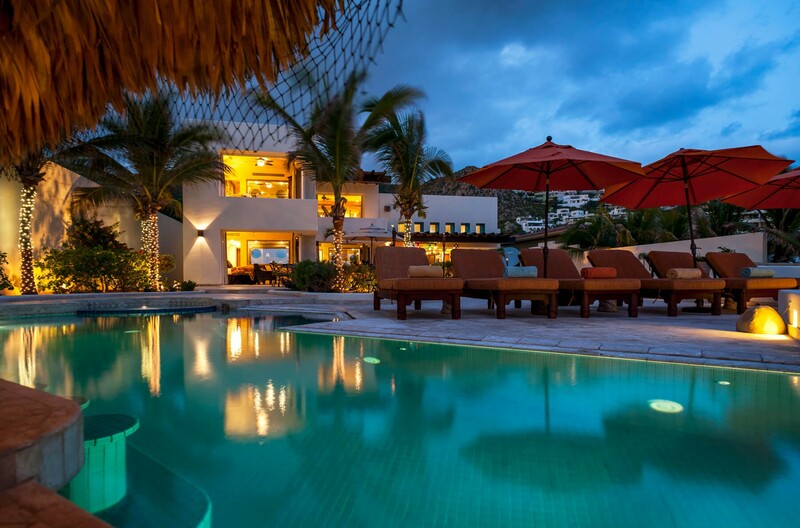 A prime location for water sports, fishing, snorkeling scuba-diving, surfing, parasailing and more besides are available, as well as numerous beaches to soak up the sun on – the closest beach to the villa is Pedregal Beach, just mere steps from the villa. 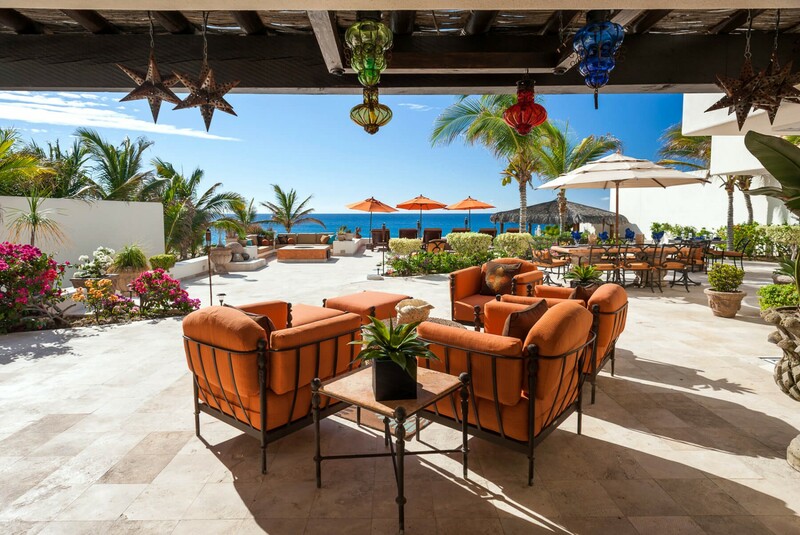 A plethora of clubs, pubs and restaurants can be found along the Marina (2.5km) – a popular spot with celebrities, the Cabo Wabo Cantina (2.8km) was founded by Sammy Hagar, a member of the band Van Halen.